"Articles on the chapel have been published in dozens of international publications, and it has received several awards. We have reason to be very pleased," says designer Mikko Summanen. Wood is a fascinating and inspirational material for designers. Proof of that are at least Helsinki’s wooden Chapel of Silence (Hiljaisuuden kappeli) and the soon-to-be-completed public sauna ‘Kulttuurisauna’. The Chapel of Silence on the Narinkkatori Square next to the Kamppi Center in downtown Helsinki is a showcase of innovative timber architecture. Offering a place to meet and retreat, it also represents novel service design. The chapel was inaugurated at the end of May last year as part of the World Design Capital Helsinki 2012 programme. The chapel was designed by Mikko Summanen, Kimmo Lintula and Niko Sirola from K2S Architects. “Designing the chapel was something unique for us. The timber structures gave us the possibility to study shapes, structures and different finishes, which is particularly important in creative and experimental projects,” Summanen says. “What makes wood interesting is its versatility. It is an architectural all-rounder, perfect for everything from building frames and facades to interior cladding and furnishings. The uniqueness of wood also lies in its emotional characteristics: it touches people through its colour, texture and scent,” he continues. With Finland’s long history in timber construction, experience in both design and building is not in short supply. However, Summanen says wood could be used in more diverse ways than today by, for example, opting for the less common wood species. The Kamppi Chapel of Silence features Finnish spruce on the outside walls and alder in the interior walls. The designer needs to understand wood’s characteristics as a living material and take into consideration the management of the moisture content of the material and the life cycle of the timber structures. Kulttuurisauna will be completed in Hakaniemenranta on the Helsinki waterfront in early spring. In addition to a sauna, the building will accommodate a small cafeteria, a small private room and an office. “Wood is a fine traditional construction material. It is also a renewable and sustainable material – reason enough for it to be used more extensively than today,” Summanen says. In late February, early March, Hakaniemenranta on the Helsinki waterfront is bustling with activity: the sauna designed by the architect-designer couple Tuomas Toivonen and Nene Tsuboi is nearing completion. The public sauna is expected to become one of the city’s new attractions. Kulttuurisauna is a blend of urban and down-to-earth vibes. Located next to the high-rise concrete housing blocks of Merihaka, Kulttuurisauna still offers the possibility to take a dip in the sea, be it summer or winter. A birch was left standing in the inner courtyard of the sauna. 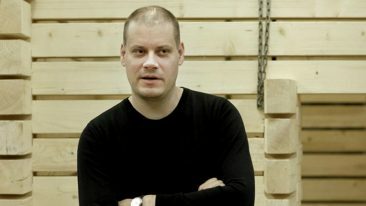 Toivonen and Tsuboi are not only the designers but also the developers, owners and operators of the sauna. “The building bears testimony to traditional Finnish sauna culture, design and sustainable energy solutions. Its carbon footprint is negligible,” Toivonen says. The building’s energy system was developed together with the energy company Fortum. The sauna is powered by bioenergy, sun and water. The stove is heated by wood pellets, and the residual and after-heat is recovered to heat other spaces.